When Dan Clanton was three years old, his mother took him to a neighbor's house to visit. The neighbor had a home recording system that made small 78 RPM records. Dan stood on a table to sing into the old-fashioned microphone, and immediately became addicted to music, singing, and performing. That addiction has followed him all his life. It led him through an interest in rock music (like so many other baby boomers), then country, and finally (in a search for music with lyrics) to folk and acoustic music. Dan says, “Today’s last bastion of intelligent music with real lyrics is being produced by singer-songwriters in the folk tradition”. 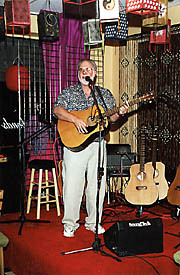 Dan has performed at folk festivals and VFW clubs, bars and restaurants, in ballrooms and on street corners from Boston to Seattle, and points in between. He has studied songwriting with the likes of folk legends Peter Yarrow, Steve Gillette, and Tom Paxton, and won awards for his own songwriting. He has shared stages with such well-known artists as Ray Wiley Hubbard, Allen Damron, Crow Johnson, and many others, performing a wide variety of acoustic tunes on 6-string and 12-string guitar. Dan’s songlist varies with his audience, but typically features his original songs (they’ve been classified as “Americana”) along with adaptations of songs from other singer-songwriters like John Prine, Robert Earl Keen Jr., and Lyle Lovett (he’s also been known to play old favorites from writers like James Taylor and Gordon Lightfoot on request). Dan was a co-founder of folksimile, the well-known Arkansas folk-rock band whose song selection, harmonies, and acoustic-based rock performances pleased club audiences for several years. Unfortunately, the band was dissolved in 1996; it still occasionally holds reunions, with fans invited. So Far, So Good, Dan’s CD featuring the best of his original songs as well as some of the country’s finest musicians, was released in early 1999. Dan is also featured on Arkansas Original, an anthology CD of Arkansas artists. Both CD’s are available at shows, or by calling or e-mailing as shown below. Dan has hosted several weekly Singer-Songwriter Showcases and Open Mics in the Central Arkansas area. His latest projects are being one-third of the acoustic trio Happenstance, and hosting the Peace Acoustic Café, an acoustic venue in his home town of Conway, Arkansas. See the other pages on this website for more information on Happenstance and the Peace Acoustic Café. For bookings, contact Dan at 501-730-8987, or e-mail dan@danclanton.com.